It happens to the best writers sometimes. We try to simplify our message. We do our best to write with clarity. But when web visitors read our content, they get confused. Web readers are in a hurry. They get easily distracted. So we must make our web content so simple, so crystal-clear that even readers racing around the internet get hooked. 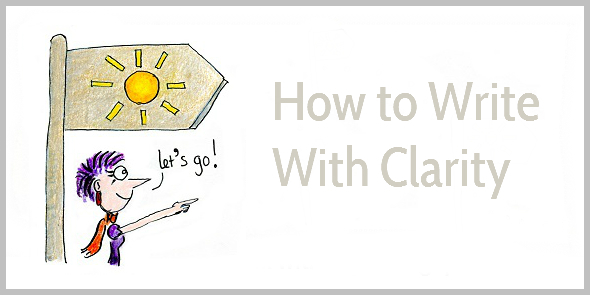 Communicating with clarity is probably one of the most difficult writing tasks. Our efforts get sabotaged easily, without us noticing it. We try to communicate too much. We try to impress with our knowledge. And we think we know what we want to say, but the truth is that we haven’t figured out the essence of our message. When you follow the 4-step approach below, your content becomes clearer, simpler and more persuasive. Readers start following your advice. They take action. They buy from you. Some people get an idea, and simply start writing. That’s freewriting, and it works well for some people. However, freewriting can lead to a complicated process of writing, reverse outlining, revising, rewriting, and editing. This process guzzles up time, and there’s no guarantee that the content will become clear and persuasive. Review your purpose and your short list of content—will your content deliver on your promise? Or should you narrow down your purpose? Irrelevant ideas lead readers astray. They might get confused, or worse, click away. So keep your content focused on one simple and clear message. Travelers feel lost when they have no clue of where they are. With your readers, it’s the same. They want to know where they are, and they want to know where they’re heading next. When visitors arrive on your home page, they want to know what you’re about. For instance: Relaxed Holidays in Dreamland. 365 Days of Sunshine. Blog posts should also remind readers why they should continue to read. The introductory paragraph of this post, for instance, mentioned that writing with clarity can lead to more engaged readers and more sales. This message is repeated, using different phrases, throughout the post. 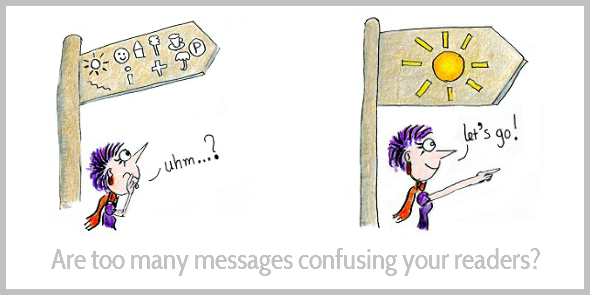 Without signposts, readers lose interest in your content. 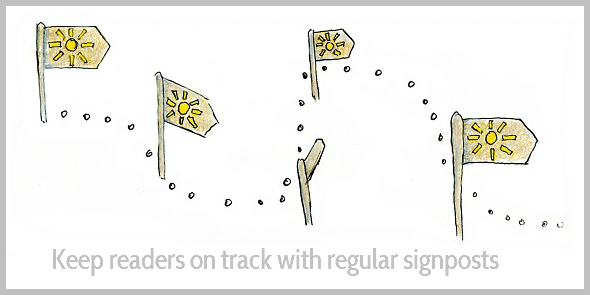 Good signposts keep them engaged. In the good old days, we didn’t have sat nav, and sometimes we had to ask for directions. Do you remember? More often than not, the directions would leave you confused. At the third road, turn right. Then at the second junction, turn left. After about 300 yards, you’ll see a large McDonald’s at your right. Immediately after the McDonalds, turn right. Go straight at the first junction. Then at the second junction (this one has traffic lights), turn left. The second description is longer, but it’s more concrete. That’s why it’s far easier to remember. Abstract language baffles your readers. Vivid language makes your message memorable. At school, we received praise for using complicated words. At college, we read texts full of long and Latinized words. And that’s how we become our own biggest enemy when it comes to writing with clarity. If we want readers to reach our destination, then let’s find the simplest route. Would you rather go to a sunny beach? Or would you go to a place where a big sphere shines full of hot gas comprising hydrogen, helium and small amounts of carbon, nitrogen, oxygen and more? Difficult words make our readers stumble. Long sentences wear them down. 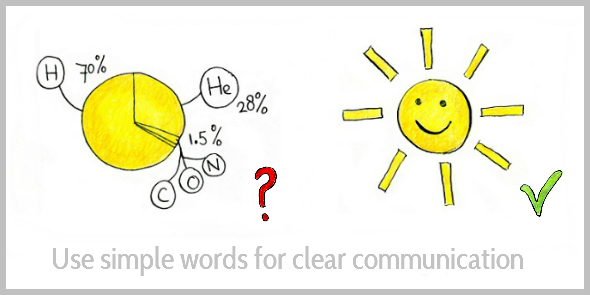 So use simple words and short sentences to communicate your message. Ever got lost in a big forest? Ever stared at a map, wondering where the hell you were? Or were you arguing with your walking companion about whether to turn left or right? Getting lost in content makes readers feel bad, too. But there’s one big difference: When you were lost in a forest or city, you were determined to find your way. Readers are less determined. Their minds start wandering, and they click away. Writing clearly signposted content requires effort. Rethink. Review. Edit. And edit again. But your extra efforts make your readers happy. They stay engaged. They follow your advice. And they might even buy from you. So make your content simple and clear. Because your readers deserve it. PS Thank you to Eric from the Year of Fear who inspired this post. Thanks, Henneke. Perfect timing. I was just getting lost in a post I have been drafting for the last couple of days. Wading through treacle would actually be a better description. You have given me the signposts to find my way out and re-write it with far greater clarity. I know how that feels! Some topics are tricky to write about. Good luck with finalizing your post, Mel. And thank you for stopping by. How wonderful to see you here too Mel(anie). Hope things are well. Might email you to hear your news. Sorry Henneke for hijacking your comments section. A bit rude. I’ve not seen Mel for more decades than I care to remember. She was a major family friend. I’m still in the UK and she left to swim with kangaroos in Oz. This was during the time of 80’s new romantic music – one good reason to emigrate I suppose. Perhaps you should change the name of your site to Friends Reunited 2. Great post as usual! Thanks for the insight. I totally agree with you. Yep, woolly language is irritating! And not just for marketing or blogging. I’d apply the same advice, broadly speaking, to any written texts we have to produce, fiction, fact or whatever. Particularly useful for those teaching/studying English as a first or second language. I’m so happy to have inspired a post here on Enchanting Marketing! I can’t tell you how much your content means to me and my writing process. This post really encapsulates so much of what I’ve learned from you, too. Writing with clarity is something I continue to work on and I’m confident with your products and weekly posts, I’ll get there! Precisely segmented and step by step approach to the content. Excellent – clean – succinct – digestible, as always. Thank you. Thank you for your compliment, Jon. I have to say, step one is the one I really has trouble with before. I usually do a lot of free writing and creating my outline as I go is something I was notorious for. I definitely had it backwards. Now, I strategically plan out my content to make sure I’m on point. That outline enabled me to write quicker and made my writing more focused. Sorry, I meant to say NOT creating an outline. When I started writing, I also did a lot more freewriting, but it was time-consuming. Since I outline posts at least a day before I write the first draft, I’ve found that writing goes a lot faster. Sometimes I still use freewriting, but then it’s a conscious choice. 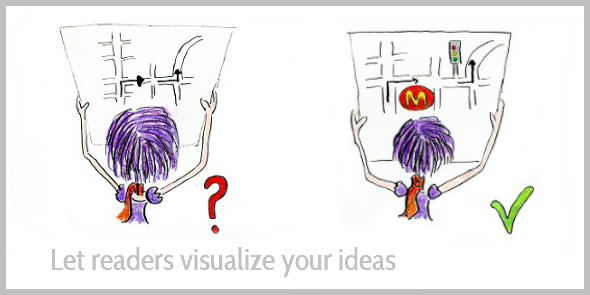 If I’m stuck, it can help to generate ideas and find the essence of an idea. What an easy post to read, thank you for that. You said something very shocking and that is that our teachers praised us for using complicated language. We were taught words instead of skills to communicate. Good advice to other fields aswell! I love how you put that, Virginia! Thank you. Great post and very helpful like always. I just wonder, why don´t you use more bold words to follow better your posts?. Just curiosity, I think it’s a good practice although I follow you until the last word. I prefer using single sentences or quotes to highlight a specific sentence. This time I made an exception because the sentence in bold didn’t seem important enough to be highlighted, but still I wanted to ensure people didn’t miss it. I sometimes use a bold font in long lists. That writers are not born, but can be developed is once more proved by you. I definitely wasn’t a born writer. I hated writing essays at school, and wasn’t good at it at all! Your last 2 sentence sayit all! Would you rather go to a sunny beach? Or would you go to a place where a big sphere shines full of hot gas comprising hydrogen, helium and small amounts of carbon, nitrogen, oxygen and more? There’s a place for each but for a vacation I’ll take the sunny beach! Me, too, Cathy. I hope the sun has been shining on you today! Thanks, Henneke. I love the journey metaphor which threads through the whole piece. A great piece of teaching. Hi Henneke, To quote Mark Twain, “I would’ve written a shorter letter if I had more time.” You really need to put something down and come back later. Then you see all the unnecessary detours and ramblings. You see it with the fresh eyes of a reader. I know that works for me. Thanks for the reminder. Yep, exactly. I try to follow the 24 hour rule for editing. When I leave my first draft overnight, I’m much better (and quicker!) at spotting unwieldy writing. Missing under step two, bullet two is the word “know”. … THEY WANT TO……… WHAT THIS PRODUCT IS. Thank you for your articles, I enjoy them. I went back to uni again after retiring. from teaching primary. I completed my Communication degree, and would like to get work in the writing field. Your tips help! Well spotted, and thank you for pointing that out, Bianca. I’m going to correct it straightaway! I love the practice of clarity and have been bringing this to my writing lately – the intention to not say too much – and at the same time how to point to what is big/vast/universal. I think of simplicity and clarity like a springboard that launches the reader into a bigger understanding of what’s being pointed at…not sure if that makes sense 😉 I’m at the end of a busy day…Thank you for the clarity of your post on clarity. Yes, that makes sense. I like how you put that – focus on a specific point, but still connect it to the bigger picture. Thank you for stopping by, Fiona! What an excellent post! It’s easy to get lost when you start to write, but with a map for directions and sign posts along the way, neither you nor your reader will get lost. Yes, so true. As writers, we can also get lost in our writing! It’s frustrating when that happens. I love how large and easy to ready your post font is. I copied a piece over to my Mac TextEditor and it said it was 18 point. Is that what it is? Yep, it’s true. Georgia 18px. There’s a “WhatFont” extension for Chrome. It makes it really easy to check font, font size, font color, and even line height on any website. Very interesting. Some time ago, I had moved up from 14 to 16 as I wanted to increase “readability” which of course is a legitimate component of “writing to communicate.” But I think I’ll make my way up to 18 now. It’s just even more readable. And thanks for the tip on WhatFont. Your font looks pretty easy to read to me, but you might be able to increase it by another 1 or 2px. Different font types can look smaller or bigger even if they are both say 18px. For readability, you also want to keep an eye on the number of characters per line. Between 50 and 75 is recommended. Yours look fine at the moment. Just check that when you increase the font size, you don’t drop below the 50 characters per line. I’ve tried various fonts and I keep coming back to my standard: Verdana. Super readable, clean. But I wasn’t aware of the characters per line issue. Yet another great tip from The H! I’m not sure if they’re the exact words and I wish I could remember who said it. Could it have been a quote from Ann Handley? A lot of people think that using complicated words makes them sound more intelligent, but thatt’s not true. Research actually suggests the opposite. I’m sure i would not get lost with you, trusting you fully and completely. I have not got lost even though have not sent any comments. My travels around the world are always connected with visiting family. Busy times and still learning all sorts of things, taking more courses on the Net. I’m glad to hear you’re doing well, Annamarie. It sounds like you’re enjoying your travels. Nice and crisp as usual. Thank you Henneke, you do make reading and writing very simple and clear. For me, this is a very good lesson to keep in mind. I reckon clarity is going to be the currency of the future. Many people think it’s authenticity, which of course is important, but if you can’t express yourself clearly, you’re best intentions are dead in the water. Interestingly I looked through your images first, got the gist, then came bak when I had time to read the rest later. Again that’s a definite trend, visuals. Many people don’t have time to read. I’m a bit hesitant about authenticity, too, but I do think content does need to have a human touch. Too many company blogs feel quite boring because there’s just information (or even worse: only sales messages) and it doesn’t feel like we’re connecting with a person. How interesting that you came to have a look at the images first – and they made you interested enough to come back to read 🙂 I agree with you that visuals are going to be more and more important; not just for decoration, but to add value to the message. Good to “see” you again, Kerstin! Straight to the point, Henneke! How simple adjustments can make the readers flow and stay engaged. I am currently working on 3.000+ words content page and I really need to improve signalization and slim the text a bit. Good design can also help a lot to make long content clear and more easily digestible. I have been following you for a couple weeks now and have used your tips in my writing often. I am here topping up my hit list. Enchanting Marketing has been added. I don’t see any guest post but maybe I am just missing them. If there aren’t any perhaps I will be the first. I am not in a hurry and am willing to persist. I appreciate the Snackable Writing Course. It is a great help. I am going through the Jon Morrow Guest Blog Course and thought it was worth trying. “I have never failed just found 10,000 ways that won’t work” T. Edison. I left a comment on your post 14 tips and noticed a link to a post on my website. A pleasant surprise. Thank you very much for that. I really appreciate it greatly. Great stuff as always. Thanks much. Another timely post again, Henneke. I don’t know how you do it, but your posts always seem to address an issue I will be struggling with. Not so much clarity this time, but just the discipline to stick to a process. Too often I find myself free writing, even when I know the result is seldom satisfactory. This post has given me a nudge to, I guess, go back to the basics and just stick to outlining my posts first. I agree with experimenting to see what writing method works best for you. I usually outline (or have a clear idea in my mind), but sometimes freewriting works, too.